Selfie sticks can generally be used with Android smartphones and iPhones. The sticks are Bluetooth compatible with handheld controls picture taking and zoom controls and come in a number of different lengths (generally 1-4 feet). The sticks work to extend the reach of your smartphone away from you so that you can take pictures of yourself, very useful if no one is around and you want a picture taking. 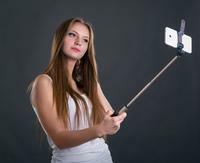 Selfie sticks are popular with millennials and anyone who posts frequently to social media. Selfie sticks generally come with a number of different options and features that are made to suit you best, such as the ability to zoom, change the reach of the stick and adjust the angles of the pictures. Selfie sticks are sometimes referred to as monopods as compared to a tripod (which has three legs instead of one). Bluetooth selfie sticks are charged with USB cables and can be plugged into compatible wall outlets, computer or even your smartphone. Charging time for Bluetooth Selfie sticks is normally 1-2 hours. Bluetooth selfie sticks connect to your smartphone wirelessly by pairing in the Bluetooth menu on your smartphone and offer a long reach. Wired 3.5MM audio cable selfie sticks connect to the headphone jack of your smartphone and generally don’t require any charging. It works the same as a Bluetooth selfie stick has similar features. Smartphone cameras that are compatible selfie sticks generally include the iPhone 4, 4S, 5, 5C, 5S, 6, 6 Plus, Samsung Galaxy S3, S4, S5, S6, Samsung Galaxy Note 2, 3, 4, 5 and other Android smartphones.